Buses can be the most budget-friendly way to get to New York City. For visitors from New England and the mid-Atlantic region, bus travel can be the ideal way to get to New York City even if it may take a little longer than a train or plane trip. While you'll certainly save money by taking the bus, there are some drawbacks. Reserving specific seats on buses is generally not possible (Bolt is an exception) so it is recommended that you arrive at least 30 minutes before departure to ensure you have a seat on the bus and can sit with your traveling companions. Online reservations with the shuttles are held until 15 minutes before departure; these buses are popular and if your schedule is tight, you should make a reservation and arrive early. Booking online is available with all services, but be aware of cancellation/rescheduling rules as well as booking surcharges. On the day of travel, in addition to getting there early, there are other things to know to be prepared for the trip. Be sure you have ID on you since photo ID may be requested when you board the bus. Some bus companies limit the amount of luggage you may bring with you so ask in advance if you have more than one suitcase and one carry-on item. Consider using the restroom before boarding. Most buses have a small bathroom on board but for longer trips, bring your own supply of toilet paper as the bus may run out. On longer bus rides, there may be a rest stop during the trip at a fast-food restaurant. All buses allow you to bring along your own food and non-alcoholic beverages. Children under 2 can often ride in a parent's lap for free but older children normally need a ticket of their own (some lines offer children's fares, some do not). The shuttles (Chinatown buses) claim to save time over the "traditional" bus companies by eliminating/reducing stops en route. Many of these shuttle passengers are Chinese-Americans and the shuttle drivers may not speak much English. There are choices for the bus traveler ranging from the traditional inter-city services to upscale bus services offering amenities targeting business customers. Greyhound is America's largest inter-city bus service. With the advent of the discount shuttle services, they have sought to compete by lowering the prices between cities served by the shuttles. 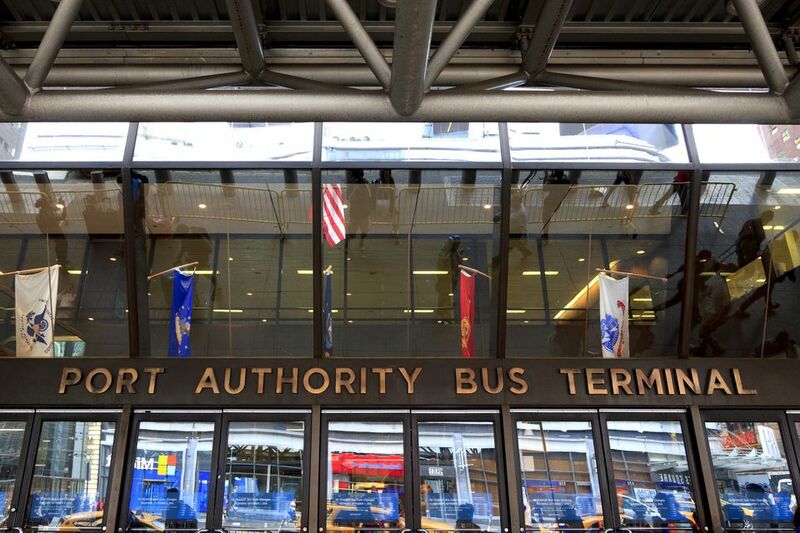 Buses Arrive at New York City's Port Authority Bus Terminal (42nd Street and 8th Avenue). Peter Pan offers bus service from the mid-Atlantic states and the Northeast to New York City. Departure cities include Washington, D.C.; Springfield, Massachusetts; Hartford, Connecticut; and Providence, Rhode Island. Discounts are available on their website, particularly for advance purchases. The buses arrive at the Port Authority Bus Terminal (42nd Street and 8th Avenue). The New Jersey Transit offers a commuter bus service to New York City from all over New Jersey, including Atlantic City, Newark, and northern New Jersey. Buses arrive at the Port Authority Bus Terminal (42nd Street/8th Avenue). The LimoLiner connects New York City and Boston, offering reclining seats, power outlets, Wi-Fi, and a variety of services oriented to the business traveler starting at $99 each way. Comfort and convenience make this a good alternative to the train between Boston and New York City. Buses depart from Midtown Manhattan. BoltBus offers service between New York City and Baltimore, Boston, Philadelphia, and Washington D.C. Buses include free Wi-Fi, outlets, and fares can be as low as $1. Their ticketing process offers reserved seats, guaranteeing you have a spot on a particular bus, which is not always the case with bus travel. Buses depart from both downtown and midtown locations but check to make sure you are going to the right bus stop since buses leave from different places depending on the destination. Chinatown bus lines are discount intercity bus services, often run by Chinese Americans that have been established primarily in the Chinatown communities of the East Coast of the United States. Increasingly, these shuttles are adding services such as free WiFi, power outlets, and comfortable seating. Daily service between New York City and Baltimore, Maryland; Rockville, Maryland; Richmond, Virginia; and Washington, D.C. Prices start at $15 one-way (promotional pricing). There are specific pick up and arrival points including Chinatown. MegaBus offers extensive bus service throughout the northeast and beyond, including destinations as far away as Toronto, Ontario. Arrival and pick up points are dependent on your destination. Service Sunday through Friday between New York City and Washington, D.C. Buses depart from several locations including Chinatown.